CAVE JUNCTION, Ore. -- A murder suspect for whom police have been searching since November was arrested Wednesday in Cave Junction in southern Oregon, according to Oregon State Police. As Crimesider reported, the hunt for Daniel Joseph Martinson heated up last week when police said he eluded officers on a motorcycle in a remote, wooded area near Oregon's border with California. Martinson, 44, is wanted in the November, 2013 murder of 39-year-old Aaron Lee Clouser of Cave Junction, according to police. Martinson was captured after a tipster who recognized him called 9-1-1 shortly after 9 a.m. Wednesday, police said in a statement. He was walking from a local food bank carrying a box of food near a park, according to police. Officers were in the area and took Martinson into custody about ten minutes after the call. 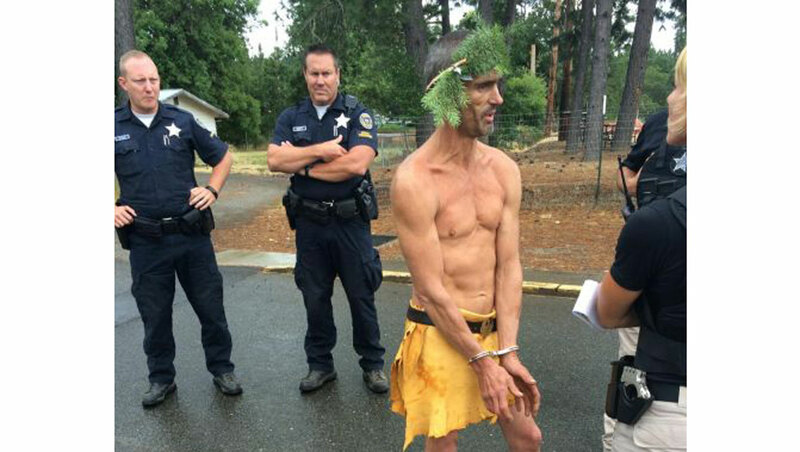 In photos released by police, Martinson appeared to be wearing a piece of cloth around his waist and branches around his head at the time of his arrest. Oregon State Police, the U.S. Marshals Service, and law enforcement agencies in southern Oregon and Northern California had all been on the lookout for Martinson since Clouser's murder last November. Clouser was discovered lying in the road in Cave Junction the night of Nov. 5, 2013, according to police. Police haven't said how Clouser was killed, or released details on any possible relationship between the two men. Before his capture, police released images of the murder suspect, widely circulated by the media, showing a missing front tooth and a tattoo on his back reading "Outlaw." Martinson will be taken to the Josephine County Jail on the murder warrant.